The importance of probability in business decision making can’t be understated. Too many just don’t see its impact. Granted, statistics strike fear in most. Their minds shut down. Still, the real importance of probability in business decision making doesn’t even deal with statistics, numbers or math. It’s its story. It’s about how to look at events. The same events produce a range of outcomes over time, not the same one all the time. While it’s hard to predict a single outcome for a specific time, it’s easier to predict a range of outcomes for an extended period. 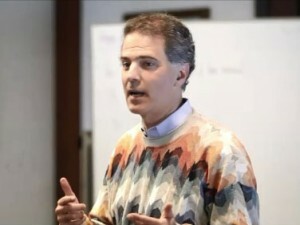 For example, a salesperson follows a sales process. It does not always produce a sale. Sales can be of different sizes too. Yet, the process can come close to saying what the sales will be over time. The importance of probability in business decision making processes shows up in four ways. Don’t overweight a single outcome. 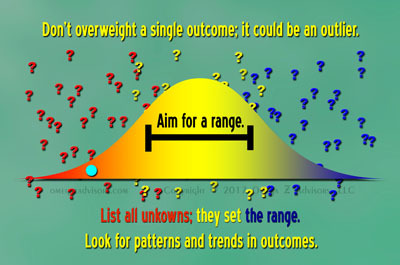 Aim for a range of outcomes centered on the most likely one. List all the unknowns to set a good range. Look for patterns and trends in outcomes. A single outcome might just be an outlier. Simply, “It’s neither as bad nor as good as it seems.” Thus, a range of outcomes is better. Also, it’s easier to hit a range of outcomes than it is a single one. Listing unknowns can help with the range. The more there are, the broader the range needs to be. The fewer, the narrower. Beware though. People prefer to talk about what they know. Thus, people easily short the unknowns. Finally, patterns and trends help a lot. They often sub when one can’t see causes. For instance, science does not know what causes people to like music. Yet, patterns and trends in behaviors show they do. In the end, the importance of probability in business decision making goes beyond statistics, numbers, math and data. Its importance rests in its story. That story shows events in a context, a spectrum. They’re no longer lonely points linked by a thread. Only better decisions can result.